Chef Owner, of Michelin starred Aniar restaurant in Galway, JP McMahon keeps a lot of balls in the air. He is culinary director of the EatGalway Restaurant Group, made up of Aniar, Cava Boedga, and Eat Gastropub, plus he runs the Aniar Boutique Cookery School. He is totally committed to local producers and engages directly with small farmers. That’s not all, he is the founding chair and director of the Galway Food Festival and is an ambassador for Irish food. In his spare time JP also lectures in Art History in UCC and is currently finishing his PhD and can you imagine on top of all that JP is organising an international chef symposium entitled ‘Food on the Edge’ which will take place in Galway in October 2015. WOW, I’m exhausted from even reading this and there’s more, when does this boy sleep! Most recently, he has self-published a book ‘Tapas, A Taste of Spain in Ireland’. 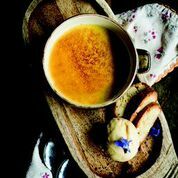 The recipes are from Cava Bodega, the much loved tapa restaurant he and his wife Drigín opened in Dominick Street in Galway in 2008. JP and Drigín love Spain. There’s always been a strong link between Ireland and Spain, and Galway in particular, dating back to 500 B.C. The trading ships would come into Galway Bay and sail right up to what is now called the Spanish Arch, home of another of my favourite Galway eatery Ard Bia. JP has a deep a love for Spanish food and culture. The recipes for the para picar (nibbles) tapas (small bites) and pinchos (a larger version) in the book reflect his interpretation of the Hiberno–Spanish version of many classic and contemporary dishes. JP is also an ambassador for the “Cook It Raw” movement started by Alessandro Porcelli in 2009. It’s not just raw food but going back to basics, re-learning the skills of producing some of our own food, fishing, shooting and foraging. For the walnut powder: Dry roast the walnuts in a 180°C oven until hard and crunchy. Allow to cool. Blend in a food processor with the sugar and the salt. Spread the powder onto a baking tray and place in the oven until a crumb texture is achieved. This will only take a few minutes so keep an eye on the powder! For the goats’ cheese mousse: Whip the goats’ cheese, cream, and crème fraîche together until a smooth consistency is achieved. Season to taste. Place in a piping bag with a medium sized nozzle. To plate: Pipe the goats’ cheese on to the plate and lay the piquillo peppers around and on top of the cheese. Garnish with some green leaves (I find mustard cress works well) and finish by sprinkling the walnut powder over the cheese and peppers. Serve with some fresh sourdough or some crackers. 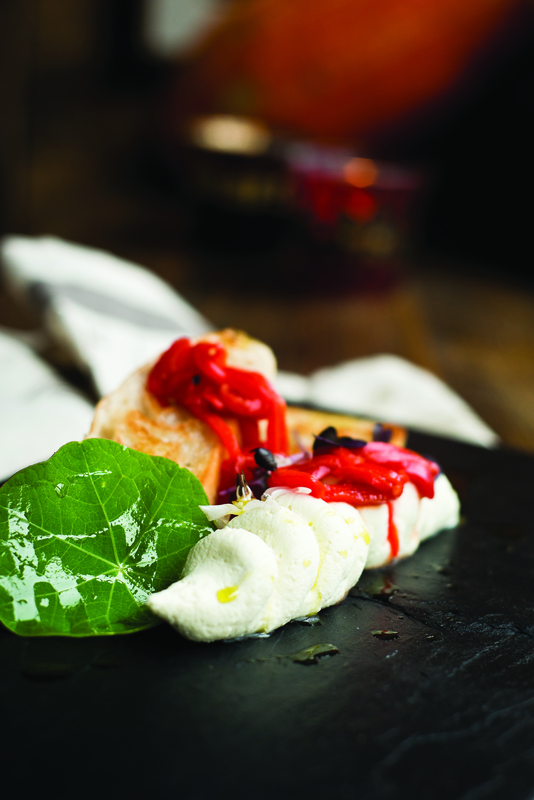 For this recipe, we use, St. Tola, a soft Irish goats’ cheese from Co. Clare. It is made by Siobhán, a good friend of mine. Piquillo peppers are small Spanish roasted red peppers from Navarra. You can find them in Sheridan’s Cheesemongers in both Dublin and Galway and many other delis and supermarkets. 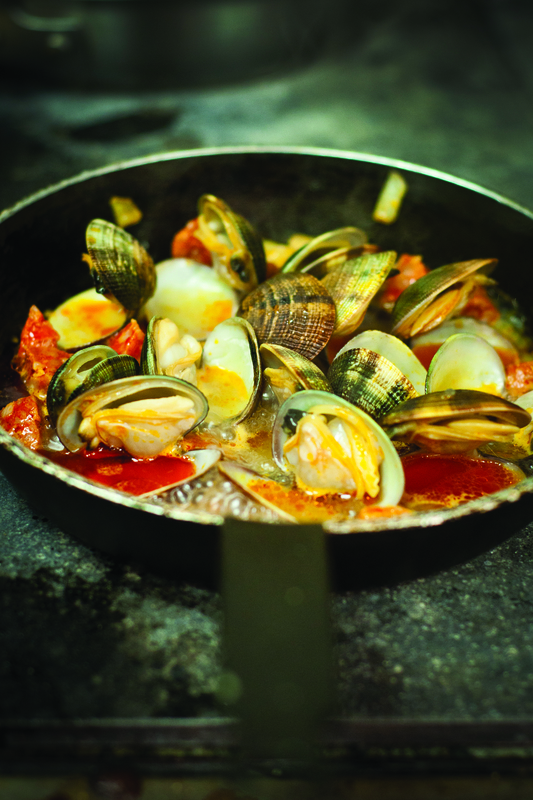 Irish clams are an extremely versatile shellfish that work wonderfully with the succulent oiliness of Spanish chorizo. 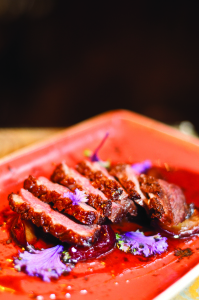 From the moment of its appearance on the menu in Cava, this dish always caught people’s attention. Not only is it a fantastic tapa for sharing, it’s also a great introduction for people who are new to shellfish. to seep from the sausage. Add the sherry and bring to the boil. Reduce the heat and cook for a further 3 to 5 minutes. Finally, add the clams and butter. Cook for a further 5 minutes or until the clams have opened. Discard any that don’t open. with some crusty bread to mop up the lovely juices. Score the fat side of each duck breast and cut in half. Season with salt. Warm a frying pan and place the breast into it skin side down. Cook until the fat is rendered and the skin is a crisp brown colour. Turn the duck over and fry on the other side for 2 minutes. Place duck in the oven on an oven tray for 5 minutes. In another pan, caramelise the plums in the honey on a medium heat. After a few minutes, add the sherry and reduce by half on a medium heat. Remove the duck from the oven (it will be medium rare: if you want to cook it more leave it in for longer) and allow it to rest for a few minutes. Carve the duck into thin slices and season with some salt. To serve: Divide the plum sauce onto four plates and place the sliced duck on top. Garnish with some sprigs of chervil. For the parsley mayonnaise: Blend the parsley and the oil in a food processor until smooth. Add the mayonnaise and continue to blend until you achieve a smooth green paste. For the monkfish: Heat a deep fat fryer to 175°C. Season the monkfish and coat in the flour. With the aid of a tongs, dip each piece of monkfish into the egg white and then into the fryer. You will need to do this quickly as you don’t want the cooking time on the fish to be too different between the first and the last piece. Fry the monkfish until golden brown. Remove from the oil and strain on to some kitchen paper. To serve: Place a dollop of the parsley mayonnaise on the plate and rest the monkfish beside it. Garnish with the lemon and the dill tops. Season again with a little rock salt if desired. Bring the cream to the boil with cinnamon sticks and zest. Upon reaching boiling point remove cream from the stove. Set aside and allow flavours to infuse for 5 minutes. In a separate bowl, add sugar to eggs and whisk until creamed. Pour the warm cream slowly over the eggs. Do not over whisk as you don’t want too much air in the mixture. Set the mixture over a pot of boiling water (bain-marie) and gently warm the mixture until it coats the back of a wooden spoon. This will take about 30 to 40 minutes. Be sure the water does not come into contact with the bowl, or the mixture will curdle. Strain mixture though a fine sieve and pour into 6 suitable round dishes. Allow to chill for 3 hours in the fridge. To serve: Sprinkle the surface of the Crèma Catalana with brown sugar and caramelise with a flamethrower. If you don’t have a flamethrower, you can put the Catalana under the grill, but be careful not to cook the mixture. In Cava, we serve the Catalana with some caramel ice-cream, fresh fruits, and almond biscuits. Good Things Café in Durrus is closed for the winter season but the new Cookery School schedule has just been published. Lots of tempting courses to choose from – how about 2 Day Kitchen Miracle, Cooking for One, or A Dozen Quickies In A Day? If you hurry you may still be able to book a place on the Seaweed Day with Carmel Somers, Sally McKenna and April Dannan on 21st March. www.thegoodthingscafe.com, phone 027 61426. Raglan, in Dublin’s hip Drury Street, is the place to pop into for a beautiful glass of fresh orange juice, they will squeeze the oranges while you wait – only takes a couple of seconds- the best €3’s worth I’ve had for quite a while. (In case you are confused Raglan is a clothes store as well as a coffee bar, 56-58 Drury Street, www.raglan.ie). While you are in the area don’t miss Industry (41 A/B Drury Street, www.industryandco.com) – just down the street packed with irresistible chic up-cycled stuff for your home and kitchen. Kaph (31 Drury Street, www.kaph.ie) is just across the road, pop your head in there too, people rave about the coffee. Considered by Helen James Café with an eclectic range is next door (35-36 Drury Street, www.dunnesstores.com). Super Miss Sue (2-3 Drury Street, www. supermisssue.com) is on the corner of Drury Street and Stephen’s Street Upper and there’s much more to tempt in George’s Street market.